The objective of the Summer School is to diffuse European values and concepts among students coming from all over Europe and beyond, in order to raise awareness in them that the process of Europeanisation leads towards a gradual and differentiated diffusion and penetration in the individual countries of values, principles, norms and forms of representation generated by the institutions of European governance. Europe, moreover, impacts also on the cognitive schemes and sentiments of perception of self and other which regulate and orient the action of national actors. Phenomena such as socialisation, mobilisation, social learning, interaction, cooperation and harmonisation in community thinking and acting, serve to press strongly for a redefinition of national and super-national interests and identity. 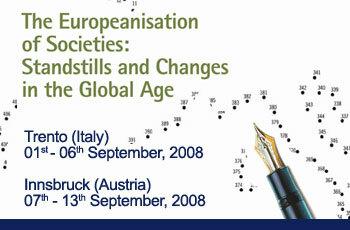 Europeanisation in old and new member states.